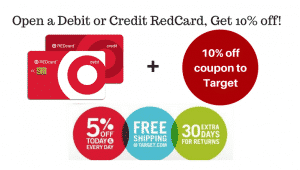 EXPIRED: Sign up for RedCard, Get a 10% off purchase coupon! If you have ever considered getting a RedCard, NOW is the time! 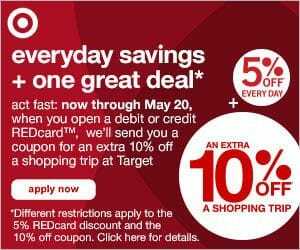 For a limited time (through 5/20 to be exact) when you open a debit or credit RedCard, Target will also send you a coupon for an extra 10% off a Target shopping trip! Having a RedCard is a no-brainer! For one, it is absolutely free. The RedCard provides a 5% savings on nearly everything you purchase, which means the card does nothing but save you money! It also provides free shipping (with no minimum) and an extra 30 days for returns. RedCard offers both credit and debit options. So even if you are not a credit card person, the debit card draws straight from your checking account. Both cards carry the same benefits. In addition, they provide free shipping with no minimum for online orders. I admit, I did not even give it a thought until a couple months ago. But the RedCard discount stacks on any other Cartwheel or promo codes that you use and sometimes, that extra 5% really makes the deal!!! Check out more info here! Previous Post 50% off Allergy Alert Labels! Next Post Banzai Slide N’ Soak Splash Park $209.99 + $40 Kohl’s Cash!